In that she talks about how public bathrooms really are the germiest places in the world and how poor bathroom design frequently foils any attempt to avoid contact with germ-laden surfaces. Such flaws include doors that open inward, faucets and stall latches that require touching, and surprisingly, hot-air dryers that draw air from the floor (ewww) and blow it onto your hands and into the air. Well, a perfect bathroom world would be a touch-free world and here’s where I would start: Toilets. A quick question to all the men reading this: How do women flush? No, that’s not a trick question. Seriously. Alright ladies, let’s tell them: With our foot! Yes, since the invention of flush-toilets, women in public washrooms have been handily balancing on one foot (often in heels! 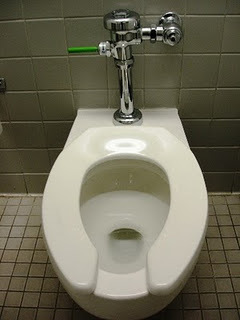 ), while flushing with the other. Little girls are taught by their moms, “No! Don’t touch that! Use your foot. See….” Many a hip have been bruised on the bathroom stall in a moment of lost balance. Many a cute shoe have been lost into the swirling water. In all seriousness, hands free flushing (either by automatic flush or foot pedal on the floor) would be a great first step towards containing the infectious agents. My local library has done it just about perfectly. Automatic flush toilets and sanitary products disposal, touch-free faucets, paper towels with automatic feed, open trash can for used paper towels, and exit door propped open (around a corner for privacy). The only thing I have to touch with my hands is the latch inside the stall door. The other change I’d like to see, which again applies mostly to women’s washrooms, has to do with hooks. Every single bathroom stall should have a sturdy hook (or 2) on the back of the stall door. Women’s bags are notorious fomites. Yes, our bags go everywhere with us, but really ..a washroom floor? Yuk. That’s just gross. I’ve gone out to eat and have watched women set their purses on the bathroom floor, then go back into the restaurant and put that same bag on the table or on the bar. Imagine how many women put their purses on their kitchen tables or counters. It does occur to me that hooks (or shelves) might be handy in a men’s room as well. Where do you guys put that briefcase while you’re using the urinal? And do I want you setting it on the conference table when you come out? In the end, none of these ideas will get people to wash their hands, but at least with proper hooks and toilets that don’t require acrobatics for touch-free flushing, some of the germs will stay where they belong — in the bathroom. I’m puzzled how come toilets are not all automatic flush or floor-flush. Now that I’m getting older, I think of it as part of my exercise, but it’s weird. And what DO men do when they use the stall? An important issue with bathrooms which is almost never mentioned is the aerosols produced when the toilet is flushed. Come the pandemic, totally avoiding public restrooms would be a VERY good idea. Bags with coliform bacteria. I think I’ll start carrying my bleach.